This past week has been a painful one for the genetic genealogy community, with a spat between two key players going public when it should not have, and members of the broader community taking sides without any way to know all the facts. I’m not going to try to review the way the spat developed. I wasn’t a party to the conversation so I’m in no better position than any user of these two sites to know the background. I haven’t said anything before today because the one thing I was determined that I wasn’t going to do was make it worse. Personally, I think Roberta nails it, and there’s not much else to be said. Except to note two things. And the second point is this: the genetic genealogy community is best served by having all the players talk to each other — and credit each other for good intentions even where we may disagree with each other. It doesn’t do our community any good at all when spectators to a spat like this — who don’t and can’t know all the facts — go haring off into conspiracy theories on social media. Yelling at each other at the top of our lungs doesn’t help us do the one thing we need to do: communicate with each other. Sometimes, we just need to sit back and let the dust settle to the point where those who can resolve the issue, who do know the facts, can get back to talking to each other. As GedMatch and Family Tree DNA are now doing. As for the rest of us… let’s just chill out and give those two the time they need to iron this out. Although I was absolutely unaware of the spat (none of it reached my very limited social media connections), I absolutely agree that it’s better to stay out of something which you don’t know much about. Even when you do have (most of) the facts, it’s usually prudent to let those closest to the discussion continue the discussion. One of the bad sides to social media, IMO, is that things are misreported, blown out of proportion without knowledge of the facts, etc., and everybody throws themselves into the fray because “all voices need to be heard”. Learn to be patient and let others closer to the subject handle it unless they ask for your opinion! And, BTW Judy, I love the illustration!! And sometimes we need to stay out of it even if the parties appear to be inviting us into it (as some of the public posts may have suggested)! FTDNA had the bigger guns. To mix metaphors, we customers needed to level the playing field. Assuming, of course, that we belonged on the playing field at all. That’s what we don’t know — and letting those who do settle this really is the way to go. I agree with Howard. In the absence of a jointly worded statement from the two parties, the PERCEPTION was that a big kid was bullying a little kid. If they had started the week like they ended it, most of us would have waited for them to work it out. Anxiously, but we would have understood. Hopefully, we have all learned from this experience. 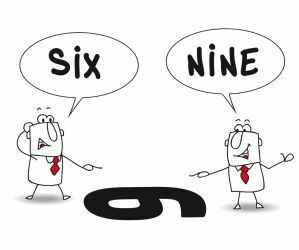 The perception was from what one side said, not from what both sides said, so — in short — people were jumping to conclusions based on incomplete information. What bothers me most of all here is the immediate assumption by some that there were nefarious motives on one or both sides. No nefarious motives necessary, or … in my case … even suspected. I am a big fan of both parties, but it seemed altogether reasonable to assume FTDNA had the upper hand, given their resources. PS – Love the graphic. Your Brisbane seminar on DNA Ethics had me primed to understand what might possibly be going on in this cryptic exchange. Your encouragement for the parties to “credit each other for good intentions even where we may disagree with each other” is something I have to remind myself of when I come across someone else’s tree that appears to be wantonly inaccurate. Sometimes the other party has conclusive information that I don’t have access to, and it discredits an otherwise reliable source that I have used. And sometimes it’s all down to opinion and we just take different views, disagree for now and look out for that missing will or parish transcript that might take the decision either way. Love your attitude. We may all find clues even in wantonly inaccurate sources… and may all get to the same place in the end if we work together collaboratively. Completely missed this, and glad of it. Did just a quick review to see what all was going on. Think you covered it pretty well. What a sad scene. I’m going record-diving again now, and when I come up for air (and sleep), hopefully it all will be resolved. It is all settled, Annie, and there will be a kit identification change at GedMatch soon.